Please note – I am NOT a medical herbalist. I experiment with herbs for my own use at home. If you have health conditions please consult a professional herbalist before consuming herbs in quantity or for medicinal reasons. I include safety precautions at the end of the post. Fig NOT helping in the harvest. Whilst harvesting I was hatching plans to make a sun-infused Dandelion Flower Oil that I can use in salve making. The oil is said to aid muscle tension, chapped, dry skin and stiff joints. I’d also heard mention of flowers dipped in flour and fried in butter which I planned to try for lunch. This can only be a lunch dish as by evening the flowers are closed and turn bitter. Such a cheery sight this time of year, these flowers can be used in many dishes to brighten your spring kitchen. 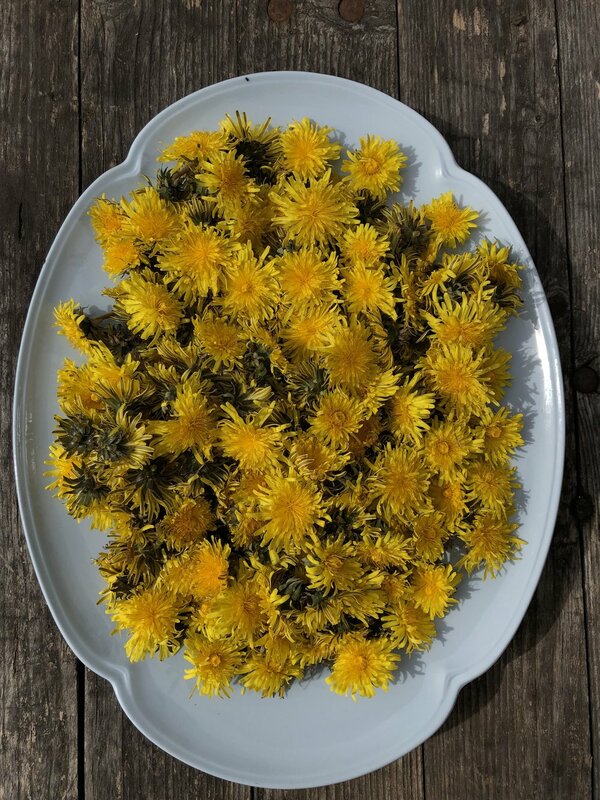 Pull off the petals and scatter them through salads, make a flower infused vinegar for dressings, try traditional recipes for Dandelion flower beer, wine and syrup, experiment with the petals in baking or infuse into honey. All plants of the plant are useful. The bitter leaves detoxify and aid digestion. Pick young fresh leaves in areas away from pollution and pesticides. Be prepared for the bitterness – we aren’t used to this flavour in modern diets but it is very good for us. I use the leaves in salads with a good soft goat’s cheese to take the edge off (Burrata also works a treat) or throw them into spring broths. They also make a detoxifying tea and an invigorating pesto. You can buy seeds for the cultivated Dandelion leaf that allows you to grow them where you choose. They are more tender than the wild leaf, but still pack a bitter punch. The root can be roasted and used as a coffee substitute although I’ve never tried this - life too short? It can also be tinctured along with the leaves to improve the liver, gallbladder and digestive system as well as helping with skin and joint problems. Known by the French as Piss-en-lit, meaning ‘piss the bed’ it also increases urinary flow and aids the urinary system. Not sure there’s much this plant can’t help with! This is the traditional way of making an infused oil. Rather than heating oil on the hob, we use the sun method. There’s something special about the simplicity of this unhurried process. Your patience will be rewarded. This is something to try in spring/summer in the UK once we have some warmer sunshine. Once you have your oil you can rub it onto skin direct or turn it into a salve or lip balm - I prefer this as is less messy. Choose the jam jar or kilner jar you want to use and make sure all equipment is dry. Pick enough flowers to fill jar. Harvest when flowers are as dry as possible and have been opened by the sun. Note that there can be lots of insects hiding in the flowers, so once picked lay them out on a plate or tray and allow the creatures to escape for several hours. I left mine in the shade by an open window. I also left my flowers to wilt down a little over night as this lets more moisture escape. Moisture is an enemy when making infused oils as it can lead to mould, which is why so many recipes call for the use of dried herbs. But it seems a shame not to work with the fresh plant when it is so abundant and there are steps you can take to avoid the pitfalls. I probably wouldn’t use this oil in cooking, because of this, but am happy to use it in a salve. Pour in enough olive oil to fill the jar. The only olive oil I had in my cupboard was some extra virgin I’d previously infused with rosemary so we’ll see what happens – a double infusion! Push flowers down with the back of a spoon to let air bubbles out. Repeat to get as much air out as possible and top with oil if necessary. Cover with cloth (I use unbleached muslin) and elastic band. This allows moisture to evaporate. Keep a regular eye that flowers don’t rise above oil - press them back in if so as they may go mouldy. Place the jar on a sunny windowsill. Mine is south facing. I also take mine outside and put in the greenhouse during the day. You can move yours outside to wherever there is sunlight as long as top is covered with cloth. Leave to infuse for 1-2 weeks. Until flowers no longer have colour and strain into a glass jug. I place muslin over a funnel and squeeze remaining oil out. This process may result in some juice getting into finished oil. If you let the oil rest in the jug then the water will sink and you can decant the oil into your final jar, leaving any liquid behind in the jug. Here’s a final thought for you…this is less of a recipe and more of an anecdote as I eyeballed ingredients rather than measured. But hopefully an idea for you to experiment further with. I mixed buckwheat flour and cornflour (only as I’m GF, your can use normal flour too) with salt, pepper, thyme leaves. I washed the dandelion flowers and dipped the wet flowers in the batter, then fried them in goat’s butter. They were really tasty, but then isn’t anything battered and fried?! You could experiment here with your own tempura batter. Or dip them in egg, then flour…but I just wanted to keep it simple. Safety precautions - seek advise about regular Dandelion consumption if you’re on blood thinning meds, diuretics or have high blood pressure. If pregnant Dandelions may make you pee more! If you develop a rash when picking could be due to latex in stems and leaves so wash hands and wear gloves.